I've tried a couple of vintage turntables the last 10 years or so, Kenwood, Technics, Luxor, Telefunken and Sansui. All of them had some major or minor issue that was dissatisfying - flutter, rumble, noisy or weak motors, broken cue levers, lamps etc. But my Dual 1214 fitted with a Nagaoka MP11 sounds AMAZING. The original cartridge was a Shure M75-6S that could have used a new stylus - it was clearly worn and the sound was muffled. But now the sound is wide, rich and airy with no background noise whatsoever, despite the fact that it doesn't have a ground connector. How is that even possible? It's like it's not even there - it does the job quietly with German perfection. The motor is powerful and speeds up swiftly. It has auto stop and auto play. No need to fumble around when starting a record - just flip the switch to Start. Bought this for $20 as my second dual with the head shell adapter missing. Found one on eBay and mated it with a Shure M75 cartridge and elliptical stylus. I checked the internals and the grease looks new. This player is a solid performer and even with the plastic base is immune to feedback even when playing loud through my system. Plenty of bass too and no howling. The compact size of the base is a plus because it will work well in limited space. Dual believer all the way! I owned a DUAL 1214 back in 1974, it played OK, I even fitted it with a better cell, the Shure M95 ED. But after 4-5 years it's platter speed fluctuated audibly (2-3 Hz), that was pretty disappointing for a so called German tank ;). In 1979 I stocked it in the cellar and bought myself a far superior Technics SL Q2 featuring quartz locked DD. I never ventured into the Dual realm ever again. 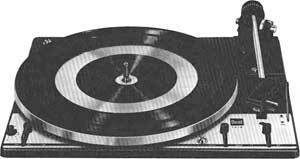 I just recently went back to vinyl with a belt driven Thorens TD 126 MK2 with SME arm and Denon DL 103R Moving coil. March 7, 2016 I bought a DUAL 1214 for the price of $75. The start/stop lever and the adjustment screw for automatic set-down were both seized up. To my surprise it was completely clean underneath 'the hood' and looking like having recently serviced. I decided to service it myself by lubricating it according to service manual. It now runs like these 'build like tanks' German clockworks are supposed to! The 1214, in my case being the 4-pole asynchonic motor version, could benefit from a heavier platter. The bigger brother of 1214, the 1216 being offered with the 4 lb platter, is basically the same unit as the 1214, so I have bought a 4 lb platter for the 1214 as well. The heavier platter should minimize wow and flutter specifications a little as an effect of the heavier platter rotating more precisely. All in all these old DUAL idlers are rock solid performers! Actually it outperforms any newer turntable I have ever owned, these being a Pro-Ject Debut III of 2011, a Marantz TT42 (based on a much later DUAL model) and The Technics SL-BD22. Sound quality of the 1214 is wonderful and the drive mechanism running extremely silent. Allthough (probably) having been in service for 46 years, it plays as if it came directly from the factory. If placed in a better plinth, the 1214 could cosmetically become a real beauty of forgotten times. The important being that the machine itself performs like a clock and plays music with a fantastic dynamic balance bringing out details i have never heard from my vinyls. Conclusion: If looking for a used turntable go for the old DUAL idlers! They are extremely solid performers that will play for decades if serviced properly at 2-3 year intervals. I would not be surprised if my 'new' DUAL 1214 will play for another 50 years! I knocked a notch off the score purely because I'm not sure where this model is supposed to fit. The basic design is exemplary, with an arm far better than it probably needed to be, despite the less 'detailed' horizontal bearings and the bias correction (anti-skating) being pre-set in three positions underneath. The platter that came with mine, despite being a substantial steel pressing for the drive with larger but thin aluminium? top platter, is still a cut above other UK made auto decks.